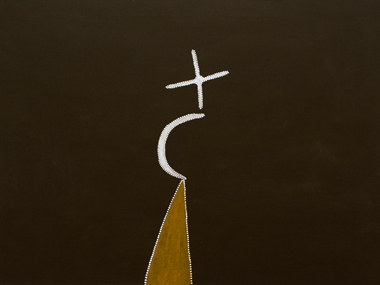 One of Australia’s most cherished Indigenous artists, Mabel Juli, has won the $25,000 Kate Challis RAKA Award 2013 for her refined, minimal painting Garnkeny Ngarranggarni (Moon Dreaming). Garnkeny Ngarranggarni (2010) was selected from a shortlist of diverse and innovative works by artists from remote, regional and urban Australia, including Teresa Baker (SA), Daniel Boyd (QLD/NSW), Hector Burton (SA), Timothy Cook (Tiwi/NT), the late Kunmarnanya Mitchell (WA), Alick Tipoti (TSI/Qld), Garawan Wanambi (NT) and Regina Wilson (NT). “There is an exciting energy about both the individual works and between all the works as they collectively reflect on an intricate range of histories and cultures,” the judges said. The annual Kate Challis RAKA Award was established in 1988 by the late Professor Emeritus Bernard Smith to honour the memory of his late wife, Kate Challis. The $25,000 prize is offered to various artistic disciplines in a five-year cycle: creative prose, drama, scriptwriting, poetry and the 2013 category, visual arts. Previous visual arts winners include Gali Gurruwiwi (2009), Ricky Maynard (2003), Brook Andrew (1998) and Lin Onus (1993). The 2013 judging panel comprised Dr Tony Birch, School of Culture & Communication, University of Melbourne; Associate Professor Alison Inglis, School of Culture and Communication, University of Melbourne; Ms Elizabeth Heathcote, representative of the Challis family; Dr Jolanta Nowak, Australian Centre, University of Melbourne; and Ms Bala Starr, The Ian Potter Museum of Art, University of Melbourne. Mabel Juli’s paintings deploy a synthesis of horizontal and topographical perspectives—stars and hills are shown in profile, while other aspects of the land are represented as if from the air. Her work is characteristically minimal; complex narratives are distilled into key iconographic forms. In the East Kimberley region of Western Australia, as in other areas of Australia, many major geographical sites are associated with the Ngarranggarni (Dreaming) and ancestral beings embodied in country. A senior artist, ceremonial singer and dancer in the Gija community of Warmun, Mabel possesses a depth of cultural knowledge that is reflected in her dedication to the detailed process required to paint with ochre. Sourced locally from beneath the ground, ochre is pounded by hand in a mortar and pestle to a fine powder so it can be mixed with acrylic binder. Mabel creates consistent, velvety surfaces by coating her canvas in multiple layers of ochre pigment. This is highly significant for Mabel and all Gija artists; the use of ochre for painting reaffirms their connection to country. It also reflects the generosity of Gija artists—they are sharing not only their sacred culture with outsiders, but literally the country itself. Mabel Juli was born in 1933 at Five Mile, near Moola Bulla Station, East Kimberley in Western Australia. She currently lives in Warmun, an Aboriginal settlement near Turkey Creek. Mabel was one of the first female ochre painters of the Warmun region. She is also a significant ceremonial singer and dancer. Her work has been included in group exhibitions including Garmerrun: all our country, Flinders University Art Museum, Adelaide (2004); and Women of the East Kimberley, Tandanya: National Aboriginal Cultural Institute, Adelaide (2002). In 1994 Mabel received the Australian Heritage Commission Art Award. Her art is held in the collections at the Art Gallery of New South Wales, the Queensland Art Gallery/Gallery of Modern Art, the National Gallery of Victoria, and the Berndt Museum of Anthropology, Perth. Mabel Juli: “I started painting when the old girl [acclaimed Warmun-based artist Queenie McKenzie] was here she was the one who taught me to paint. She told me, 'You try that painting’, and I started to paint. I was doing that Karnkiny [Moon Dreaming]; that’s the painting I started with - because my mother and father told me that Ngarranggarni [Dreamtime] story. I was reminded of all those stories from my mum and dad—like Glingennayn Hill and the Old Woman Singing Out for Her Dog. Those stories come from my country [Springvale, south of Warmun]. In the Ngarranggarni (Dreaming), Karngin the moon was a man. One day, Karngin came back from hunting kangaroo and saw a girl sitting with her mother. She was very beautiful with long black hair and he fell in love with her instantly. This woman was Darwool, the black-headed snake. She was also Karngin's mother in law, and so it was taboo for him to marry her. The people asked him, "who do you want for a wife?" He answered, "doyen, doyen (that one, that one)", pointing to Darwool. But they said "No, she's your mother in law, you must marry one of these promised girls, these nyawana—Darwool's daughters". The people told him "You must go away". Angrily, he left and walked some way before he sat down and turned into hill. He cursed the people, telling them they were going to die, but that he would always live. As the moon, he came back to life every month. 05.07.13 | Resale Royalty Scheme Review – Only One Week to Go!